Aquaman finally came to my review! (See back issues... I mean my old reviews to read my pleas). 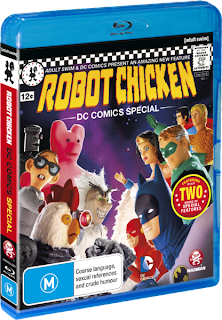 The humor in this show is pretty funny with some very solid gold moments and I can see some of the segments like "Actual DC Characters" making regular appearances in the main Robot Chicken series. However the humor is also very crude so it won't be everybody's plastic cup of tea. There are a few problems with this but they also count as positives as well. 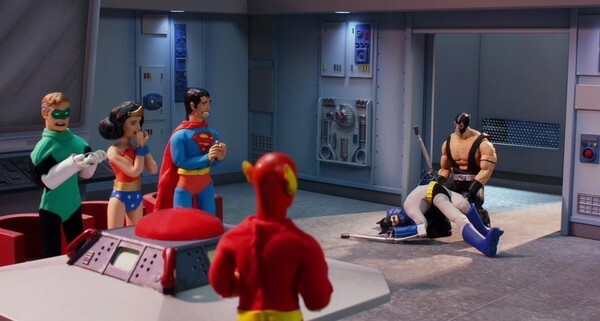 Unlike the typical Robot Chicken episodes where the references are more broad these skits mainly appeal to the DC Comics readers so not everybody will get them (that's the negative) but the DC fans will absolutely love them (the positive). The character selection was what you would expect but there were some characters that would've been great in this but were omitted like "Red Tornado" and "Booster Gold" although you can find them in the deleted scenes so it's not all bad. The thing that will most likely turn you off about this release is that the main feature only goes for twenty minutes which may be a bit much for people to be dropping $25 into. The stop motion animation is great with some really smooth animations and also some clever ones like how they make them talk by using pieces of paper with mouths drawn on them. Sure it can be a little cheesy to some but I find it really charming and smart. The toys... I mean the action figures they used (it is the DC Comics special after all so it's action figures) are very awesome but it's such a shame they had to break them out from their original packaging... Eh that was a terrible joke but alas the figures do look awesome and they use actual ones as opposed to home made ones and I just want to go out and buy some of them. If you are fans of Family Guy or American Dad (or one of those rare fans of Cleveland Show) you will be very familiar with the voice cast but for those who aren't I wouldn't worry too much about it. The voice work surprisingly matches up with the characters really well and does make the characters seem very exaggerated but in a fun way. While the main feature is pretty short you do get a very giant sized action packed special features section full of goodies. You have a "making of" documentary that has the crew talking about the show while showing them work behind the scenes, RCDC's Aquaman Origin Story which just has them making fun of Aquaman some more, A feature called "Chicken Nuggets" that has a special button displayed on the screen during certain parts of the show that shows you some more behind the scenes stuff (like storyboards) when pressed, Two audio commentary tracks with one from the writers and the other one from the actors, The Robot Chicken crew taking a tour through DC Studios, A feature called "Stoopid Alter Egos" that has some of their crew dress up like superheroes promoting the show in Hollywood, Outtakes, Thirteen extra segments that were cut from the special but are only in storyboard form, and a quick questions and answers feature that originally aired on the DC website. Overall I really did enjoy this special and it is has some of Robot Chickens best work to date. 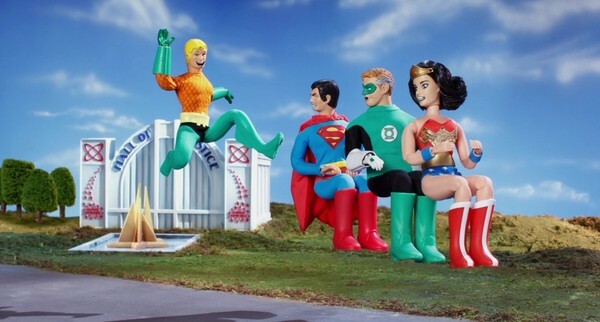 Although if you are expecting a serious comedy or a fan of Robot Chicken but are unfamiller with DC's characters I would stay clear away from this. Good stuff.